But all is still well! In fact, I came down to Florida to preach at the most amazing church: Next Level Church of Fort Meyers Florida. It felt a lot like Substance. The worship was great, the people were great; but, most of all, the lead pastors Matt and Sarah Keller are truly one-of-a-kind. I’ll tell you what: Pastor Matt is like my brother from another mother… for real! Set aside the fact that we have the same over-caffeinated preaching …Believe it or not, we were born only hours apart in the same year! And I’ll tell you what, it’s so hard to find down-to-earth pastors like the Kellers. So get ready Substance: I’m probably gonna have them up to preach A LOT!!! (during the summer). In fact, Pastor Matt just released a brilliant book for pastors called “Up the Middlle.” So, if you have a chance, check out his website at www.upthemiddle.org. And remember, we’re calling it the “State of the Church” Address so get ready! I’m gonna share some wild news this Sunday that will be exciting for the whole church! So be there or be square. But I’ll tell you what: Traditions are a valuable thing. (I know. It’s strange to hear that from a man who named a church “Substance”) But, in saying this, it’s not just the tradition that matters: Mainly it’s the friendships that you nurture and the memories you make. For example, one of my fondest memories as a kid was staying up late playing sheep’s head with my grandparents (it’s a German card game – not animal torture). You see, traditions can be silly (like me sleeping in my backyard shed with my girls last summer). But, big or small, these traditions are memorable. 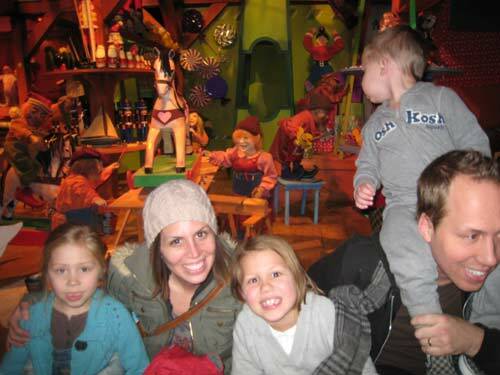 And to this day, when I think back about the holidays, I think of the fun times we had together as a family. As I’ve watched dynamic families over the years, I’ve noticed that, the ones who have the most fun family traditions end up being the ones who stay the closest over the years. Of course every family goes through change. And perhaps today, your family isn’t as close as it used to be. But, quite often, it’s those stupid but fun traditions that always end up pulling everyone back together. Hence it encourages me to do the best job possible in making our family traditions the best they can be. So, as you go into your holiday season, ask yourself: What kind of traditions does your family have? What kind of fun would create common ground between yourself and the rest of the family? And most importantly: How can you keep intimate friendship and fun at the center of everything you do? I believe that, in answering these simple questions, you’re worshipping the Lord by being the family he created you to be. Does that make sense? All I know is this: When my kids grow up and bring their kids downtown… they aren’t merely going to see a Hollidazzle Parade… they’re gonna see a “Haas-a-dazzle Parade”. And as they smile and think back on all the ridiculous adventures that their Father concocted, my hope is that, deep down in their hearts, they will know: “I was loved”. After all why else would their father sleep in a shed in their backyard with them? So, as you go into your holiday season… don’t be that spaced out relative who sprawls out on the couch all weekend. It might take a little extra thinking… but, it’s never too late to start a crazy fun tradition!!!!! I love you guys!!!! Merry Christmas! Clark Griswald: Eat your heart out! Does anyone else go overboard with Christmas decorations? The people who run the Christmas sections at Menards and Target both know me by name all ready! I don’t know why but ever since I was a kid I’ve been obsessed with decorations. There’s nothing like watching How the Grinch Stole Christmas while decorating the tree. And perhaps I drank too much egg nog; but, this stuff is exciting! I just put over 2500 Christmas lights on my house. And I haven’t even started assembling my little “Christmas Village” yet! But my mom can vouch for me. I’ve been this way ever since I was a little kid. In fact, in Wisconsin, I used to really go overboard with outside decorations. I was the first person on my street to put up lights. And before long my neighbors and I started escalating things until our whole street became a winter wonderland. So, you can imagine just how much it kills me that we don’t have a church facility to go overboard in! Every time I see one of those 25 foot tall Christmas trees, I’m tempted to buy it (in hopes that someday we’ll have a church foyer to put it in). And when we’ve got to set things up every week, it gets pretty tough to be elaborate! But alas, I know that we are in the center of God’s will by staying portable. Yet you ask: “So what exactly is your plan for a facility? …or at least some church offices?” Good Question! Whenever I tell people that we’re a 1500 member church with no offices, they all realize that we operate in chaos. Yet, for months Pastor Pete and I have been pounding the pavement… looking for the best warehouse possible to house our new operation center with a 300-seat leadership auditorium. Of course, this wouldn’t be a permanent “weekend facility” (because that’s gonna take a little more saving). But we definitely need a better space for our staff, our interns, our video studios, our youth ministry, and a boat load of other ministries. So as you pray for a parking spot at your local Shopping Mall this Christmas, don’t forget to pray for us. The staff has a lot of things cooking behind the scenes that we’re gonna unveil this January. This is really going to be an exciting new year! So have fun this Christmas. And get geared up! Cause, Substance, we’re about to party like its 2009. My wife and I smooched for the first time over 17 years ago! (We were actually only 16 years old! : ) Man, it’s amazing how fast time flies! But my wife and I have been so busy with the church lately that we’ve almost forgotten to continue our seventeen year tradition. So the remedy: a sudden and random romantic getaway! My wife booked this swanky hotel in downtown Minneapolis. WOW. I felt like I was James Bond in some futuristic night-club hotel. 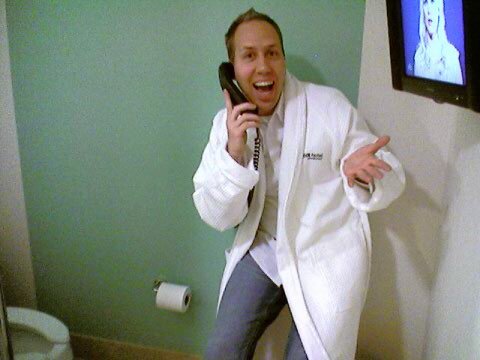 Even the bathrooms had flatscreen tv’s in them with Cable tv! To boot, there were handy telephones next to the toilet. (Note the picture below). Of course, when all is said and done, our tradition of smooching has now been reinvigorated. However, if I ever put a big flatscreen tv in my bathroom at home… make certain that you confront me. O.K.? Stewardship ethics aside… no one needs to sit on their toilet for that long! I love you Substance! Thanks for praying for us! At my church in Wisconsin, I oversaw a K-12 Private Christian School. So, being the CEO of the whole organization, I was always being asked to do dignified “politician-like” things (like speak at graduation ceremonies). You see, half of our church were people in their late 40’s and 50’s. So, being the”hippy-freestyler” at heart, I never seemed to fit the crusty role of being a dignitary. Yet, nonetheless, I’d always try to carry myself a bit more “presidentially” at school events… (you know… wear suits, ties and that other stuff) — so as to make the school look credible in the community. So, one day I was riding the half-pipe at the local skate-park. I was hot, sweaty, stinky, and shirtless. (I probably looked like had just crawled out from the sewer.) And sure enough, up walks several dignified moms whose kids were new to our Christian school. And before I could say: “What are you doing here?” The very same words came flying out of their mouths (while their junior high kids came running out with their skateboards). They all looked at me as if I was cross-dressing (or something equally strange for the leader of their kids’ school). As we awkwardly talked, the only thing I could think about was the fact that these moms were looking at my hairy chest… (not very presidential from the standpoint of our school). But how was I to know that all of these church-ladies would show up at the city skate-park? But, I guess, the lesson I learned is this: I will never fit the mold of a dignitary, politician, or pastor for that matter. There’s nothing worse than pretending to be someone you’re not. And that’s what I like about Substance: Just about everyone I meet there is so Non-Churchy… yet passionate about God at the same time. So, we may not attract very many “dignified Christians;” but, frankly, I’m fine with that. And hopefully you feel the same. So Ride On Substance church! Ride on. People, I just got to do the coolest thing yesterday. Wow. I’m still buzzing over it. For those of you who don’t know, I do a lot of mid-week speaking engagements at various colleges. There is something that is absolutely fun about speaking to college students! 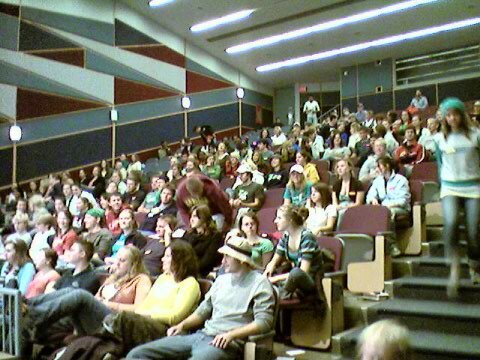 In fact, it was these college events that first sparked a desire in me to plant a church with young people. And last night reminded me again why we launched Substance. Thursday evening I drove to UW Stout in Wisconsin and preached at the Campus Crusade for Christ group. Many of our original Substance launch team actually came out of this very ministry back in 2004. And, as usual, this Crusade is fantastic at getting nominal and unchurched people to be open to the Gospel. Before I went, I had this super strong sense that God wanted to do something amazing. So, I spent the day fasting and off I went. When I arrived, the room seemed pretty packed. And I’m telling you… I could sense the power of God like I haven’t in a long time. It was powerful. Before I even finished speaking, there was a girl weeping in the front row. And by the time I asked for a response to God’s Word, it seemed like the entire room was ready to fall to their knees. We saw a huge number of college students come into the kingdom. The atmosphere was just electrifying. Even now, I know that, forever, I’m gonna rejoice that God allowed me to be a part of that night. So, if God leads you, pray for the Campus Crusade in Menomenie. God has blessed us through them. So let’s return the favor! All right? Bringing Home the Bacon AND Frying it! Substance church, we had another wild retreat this weekend. And no: it wasn’t for the guys this time. To use disco-speak: “It was ladies night. And the feeling’s right.” And to boot: we had a record number of ladies at it! So hats off to my wife and all the leaders who made our Women’s Retreat a smash success! Of course, I couldn’t personally participate (for obvious reasons); but, I have been blown away by the fruitfulness that resulted. Like our men’s retreat, the retreat was dominated by a delightful number of new Substance members (as well as many new Christians). So thanks for all of you lady-leaders who went: I just want to say thank-you. Our ability to attract new and unchurched people is easy compared to our ability to find mature Christians who are willing to lay it out in order to disciple others. The sheer quantity of outreach and mentoring that happened during this retreat was staggering. As for me, I was on Dad duty. (& you have to realize, I don’t cook anything except for Ramen); so, this was a big ordeal for me to feed 3 energetic kids. On Thursday night, I gathered my kids together to perform the opening ceremony for “Daddy Weekend Extravaganza” (which was a three day program of over-hyped events… designed to distract my kids from my obvious lack of maternal capabilities.) And WOW, I am amazed how many diapers my wife changes on a daily basis. (Thank the Lord! I had only one wild diaper defecation experience.) And finally, after eating candy and popcorn for breakfast on Saturday, my girls were pretty much sick-to-death of our “Extravaganza” activities. The only thing on all of our minds was: “When’s Mommy coming home! ?” It suffices to say that I broke down and bought a Sony Playstation 3 to survive the weekend. But overall, the Ladies Retreat was definitely worth it. And I think I can say on behalf of all forlorn Dads that we’d do it again for you ladies anytime… well, at least once a year. But, get ready guys. The ladies are back. And they are ON FIRE! Are you getting tired of all of these political ads? I think the ones that get to me the worst are the commercials that highlight all of their political opponents attack ads. In other words, it’s an attack ad that is attacking the morality of their opponent’s attack ads? Hmmm? Something seems strange about that picture! Equally bad are the pundits who grotesquely escalate the stakes of every election: “Vote for [fill-in-the-blank] …or we’re all gonna die!” I.e., they make it sound as though almost every miniscule policy of their opponent is going to completely and utterly destroy life as we know it. Don’t get me wrong, there are indeed a “few hills worth dying on”; but, we also have to acknowledge that desperate politicians, and desperate Christians — who have no faith in Christ are likely to make desperate statements. Fear is a classic motivation strategy. And, even Christians are likely to puke their fears on you before election day is over. So be on guard. Preachers and radio shows are especially good at this. But it’s important to know this: Fear is not of God. For God is love. And perfect love casts out fear. Paul demonstrated this when he wrote his letter to Timothy. In other words, Paul was quite different than all of the pundits we hear in the news. He wasn’t out there exaggerating and demonizing leaders with every breath. And, I don’t know who you are voting for; but, I’m pretty sure that, either way, none of our options are as bad as Nero. Even more, Paul said that we should give “thanksgiving” for “all” those in authority. I.e., Paul didn’t exclude anyone – even Nero – which says numerous things about Paul. 1). Paul wasn’t a fear-monger, he was a child of God! When God is your Father you simply don’t need to worry or over-react. 2). Paul was so secure in God, he could think about positive things – even during the worst of times. So, if you find your own heart getting anxious this election season, I give you a solid Biblical command: Be At Peace! I’m Peter Haas, and I approve this message! 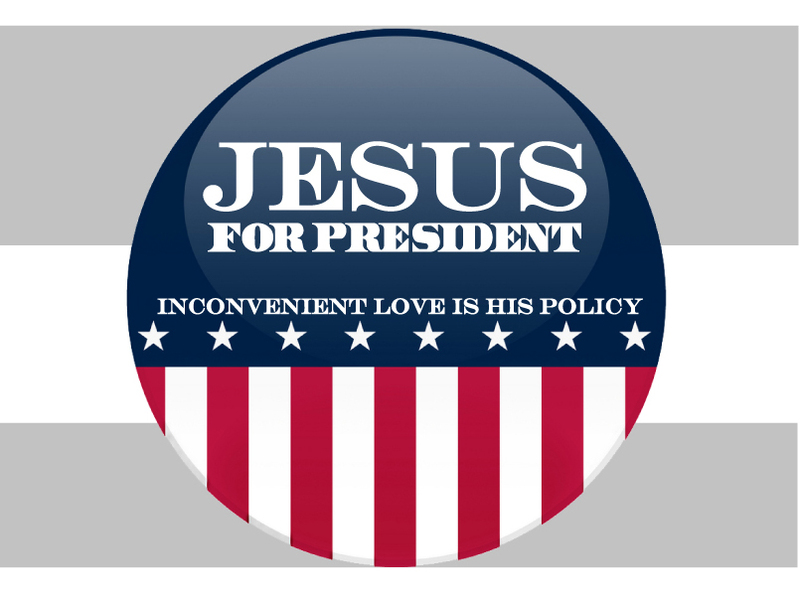 P.S., Come on out for our new series: Jesus for President! Our First Star Tribune Article! Well, I guess we are an officially “known” church in the Twin Cities. After all, we just got our first Star Tribune article written! We got two pretty large pics… one of which was a 8 x 10 spread across the front of the variety section. Of course, I was uncertain how it would turn out; but, it happens to be a really nice article! And, if that doesn’t work, I’ll try to paste another copy down below. But, isn’t it fun to start getting a reputation in the city? I mean, we’re a brand new church. We’re a four year old church — fresh out of our diapers. I remember when we first planted, I tried to get a $10,000 line of credit at the local bank (to establish our credit and reputation for the future). At my last church, I had numerous banks begging me to do million dollar loans, so I thought this would be easy. After being denied, the banker said: “I’m sorry. You guys do not look like a very stable investment!” (I was so shocked and mad! After all, I was only doing it to establish some credit!!!) But even still, I had to pick my fragile ego off the ground and look towards the future. The bottom line was, our organization was too young — and had a weird name! But doggonit! We’re in the newspaper now! So friends, let’s celebrate! Twin Cities: Here we come! Three Services? Hold those Horses! Can you believe that it’s already been four years!?! God has really been doing amazing things. In case you weren’t there this last Sunday, we bought everyone a $5 dollar Caribou Coffee Shop Card as a celebration gift! We love you guys! Thanks for making Substance such a stinking cool place to call home. Believe it or not, we’ve had over 80 new people come to our newcomers luncheons at our house this month! (Our carpet is totally trashed!) But man, it is so much fun to hear all the stories of people whose lives are being transformed. I mean, I have never in my whole life heard as many radical testimonies! I can barely go into a coffee shop without having someone tell me of their 180! Church: we are living the dream. People have been asking me: “When are we gonna add a third Sunday Service?” Frankly, I don’t know. In fact, believe it or not, I’m in no rush to do so. After all, this is a marathon, not a 100-yard dash. And God gave strict instructions about times like these: “even during the [busiest] seasons you must rest” (Exodus 34:21). To make matters worse, my seminary classes at Bethel are in full swing! So if you’re talking to me and I start spacing out (while drooling), I hope you’ll understand. But, rest assured dear friends: my family and I have been relaxing together as well. She promised me that she would go on the new roller-coaster ride at the Mall of America. But when she saw it, she totally chickened out!!!! Can you believe that? 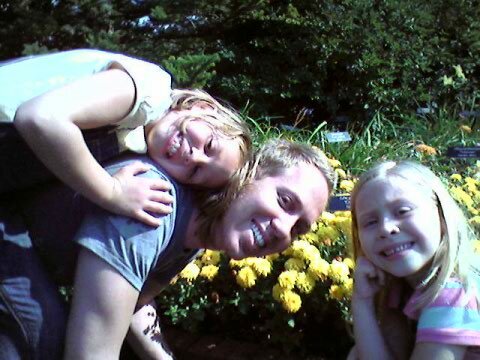 And, then on Saturday, we took all three kids to the Minnesota Arboretum down in Chaska. Wow! Now that is a gorgeous place. …It’s like a thousand acre landscape garden – with oriental gardens, hedge-mazes, and a endless flow of 17 year olds getting awkward senior pictures taken. And I realize that most people don’t get turned on by Arborvitae foliage, but man, If you have a family, you gotta go sometime. But here’s the deal church: “What good will it be for a man if he gains the whole world, yet forfeits his soul?” (Mt. 16:26). In other words, in the busyness of life, we need to tend to the fundamental things… our souls. And yes, I am concerned about three services. But I am far more concerned about my relationship with God, my wife, and my kids. And frankly, God has similar plans for you. This has been a fantastic four years for Substance church. But let’s take care of our souls first so that, four years from now, we can still be around to enjoy it! Make sense? Stop and Smell the Roses !! !